Quiche is sometimes overlooked as a dish to serve guests. I don’t understand why. I love quiche for informal gatherings, especially accompanied by soup or salad. It’s an easy weeknight supper with my kids. Leftover quiche is also super easy and yummy the next day, warm or cold. Since I started this blog, I’ve made quiche more than a dozen times. Yet, I have shared only one quiche recipe. It was a recipe for a Leek Quiche with Wild Garlic, a perfect springtime dish. What can I possibly add to the numerous quiche recipes already available on the internet? Well, many quiche recipes include cream or other ingredients to add richness. Or they feature a precise combination of ingredients, as if to suggest that finding a winning mix is difficult. My basic quiche recipe is simple and requires less fat than many other recipes. This post is intended to be a guide on how to make a quiche. Hopefully, you will use this basic quiche recipe to inspire you to create your new favorite quiche. Scroll down to the bottom to read instructions for making a Vegan Quiche. When I make a quiche, I usually follow a basic formula of 3 eggs and 2 cups of milk for a single pie. I then add whatever special items I want for that occasion: vegetables, protein, cheese and herbs. Please note in an original Quiche Lorraine no cheese was included. Over the years, however, many people have started to add Gruyère or other cheese in their Quiche Lorraine or in other quiches. As I omit the cream all together from my quiche recipe, I think a little cheese helps add a bit of richness to the final product. I’ve listed below the main additions being vegetables, protein and cheese. Feel free to use one or more of these elements in your quiche. None are absolutely required. Your quiche will be perfectly fine without cheese, protein or vegetable. I recommend, however, adding at least one of these ingredients to make your quiche tasty. You may also use more than one vegetable, protein or cheese in your quiche recipe. For instance, leeks and mushrooms orGruyère and Parmesan cheeses. I leave the combinations up to your imagination. Countless vegetables are tasty in a quiche. For example, spinach, leeks, onions, broccoli, asparagus, chard, beets, mushrooms, tomatoes, zucchini or other squash, are all yummy additions. I’d recommend cooking the vegetables in advance and draining any excess liquid. It’s really important to drain all the liquid out of spinach, tomatoes, and other vegetables containing a lot of liquid. Be careful not to overcook the vegetables as they will continue to cook a bit more when the quiche is in the oven. Protein should also be cooked before adding it to the quiche. Salmon, ham, and bacon are natural features in a quiche. This does not mean you cannot add other sources of protein, animal or plant-based, to your quiche. Tofu can be added easily and might help with the creamy texture of your final result. You can blend in silky tofu with your egg and milk mixture to add extra creaminess. Or you can sauté or grill cubes of tofu (marinated or not in advance) and add them later as you would with other sources of protein. As you might imagine, tofu will not add much flavor to your quiche. Cheese adds thickness as well as a hint of flavor to your quiche. The type of cheese you select will depend on the other ingredients in the quiche. Goat cheese pairs well with salmon, spinach and many other vegetables. Roquefort is lovely with beets, bacon, and tomatoes. If your cheese has a stronger flavor, such as Roquefort, add just a little quantity as the taste will go a long way. If you are more conservative concerning your cheese choice, a blend of gratin cheeses (even frozen) will always be nice. A blend of gratin cheeses usually contains such favorites as Gruyère, Emmental, Fontina and Parmesan. Choose a cheese that will enhance, not overpower, your other ingredients. Bland creamy cheeses, such as Ricotta or cream cheese can be added to the egg and milk mixture to add a creamy thickness to your quiche (and perhaps absorb some of the excess liquid) without affecting the flavor much. I add most of my cheese in with the other ingredients before pouring the final mixture into the pie crust. I then sprinkle some cheese on top to improve the final look of the quiche. The taste of baked cheese on top of a quiche will be slightly stronger than the cheese inside the quiche. Herbs and spices in a quiche should help bring out the flavors of the individual ingredients and bring them together. I personally love thyme so will add this to many of my dishes. Adding a teaspoon of an Italian seasoning blend or Herbes de Provence will often be a safe bet. Dill is particularly tasty with spinach and with salmon. Basil will add a summery and peppery taste to many of your Mediterranean-style quiches. Fresh herbs are really lovely if you have some available. You get the idea. Keep in mind that you need about one-third (by weight, not volume) the amount of dried herbs to replace fresh herbs. Try to keep the blend of herbs simple. Limit your herbs to three types. Quiche is a case where less can be better. Lastly, don’t forget garlic in your quiche. Again, a small amount of garlic will go a long way, unless the other ingredients feature strong flavors. I usually prepare my own Pastry Crust when I make quiche. By hand or with a food processor a Pastry Crust dough takes only a few minutes to create, not including the rest time in the refrigerator. Don’t feel guilty, however, if you prefer using a store-bought dough as they can be a good replacement when time is short. 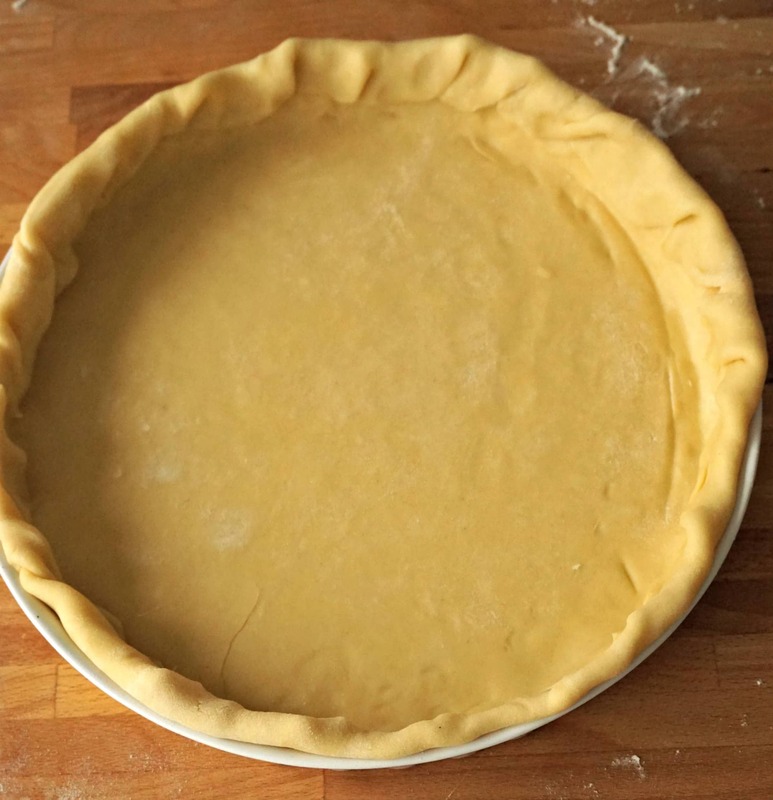 Keep your pastry crust dough cold until you are ready to use it. Roll out your dough and place it over your baking dish, leaving a little room on top for decoration. I usually just crimp the dough between my thumb and forefinger as I go around the dish. If you are feeling more artistic or creative, feel free to add other designs to make your quiche stand out. Before adding the liquid mixture on top of your pastry crust dough, take a fork and prick holes all around the bottom of your crust dough. I customarily brush a little egg white on the bottom and sides of the dough to help prevent the crust getting soggy while the quiche bakes. Sometimes the vegetables used in your quiche will give off too much liquid. Try spreading a teaspoon or more of flour on the bottom of the crust or mixing it into your liquid mixture before pouring it on the crust to help absorb the excess liquid. Many people eat with their eyes as well as their mouth. In short, this means presentation can be important. 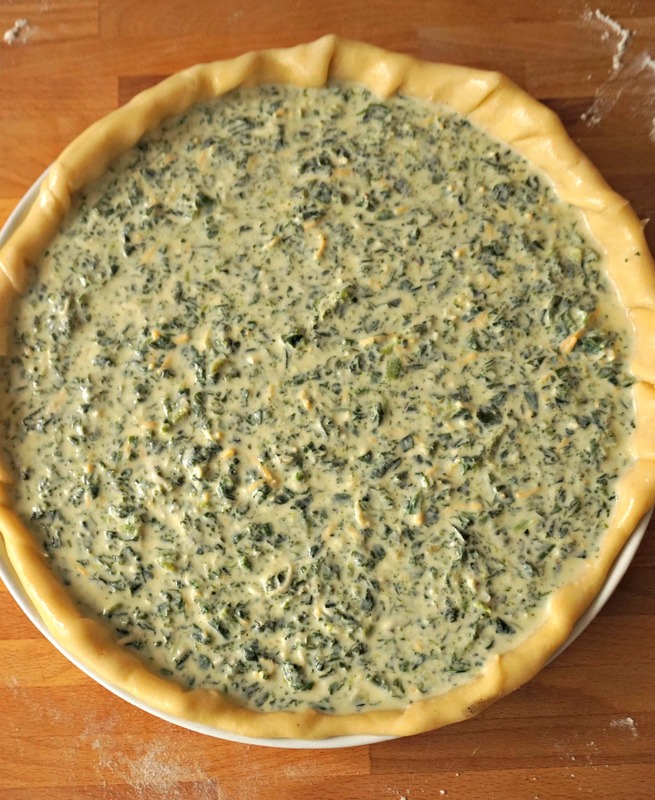 You can place the vegetables and protein in a pattern on top of the unbaked crust dough and then pour lightly the egg and milk mixture (with most of the cheese and herbs) over them. Fresh herbs can add a pretty touch on top of the quiche. Place fresh herbs (for instance, leaves) on top, while lightly putting some of the liquid over them so they don’t dry out or burn. If you are looking to make a vegan quiche, you can blend firm tofu (after removing the excess liquid) in with your milk mixture. I’d recommend breaking the tofu down with a fork or even a hand blender with a little milk before adding it to the other ingredients. Plant-based vegan cheeses are fine substitutes for their dairy counterparts. Likewise, almond milk, soy milk or other plant-based milk can replace dairy milk without any problems. Remember to use a vegan crust. The baking temperature and time will be the same as for a traditional quiche. I hope this quiche recipe will guide and inspire you when you create new quiches. Please take photos of your quiche and share them on Instagram with the hashtag #belgianfoodie. I’d love to read your feedback and experiences below in the comments. Share this basic quiche recipe with your friends. If you are using your own pastry crust dough, prepare it first since it must sit in the refrigerator about 30 minutes before rolling out. If you are using store-bought dough, no need to worry about the dough until it's time to use it. Wash and cut the vegetables. Put the oil in a pan over medium heat and then add the cut vegetables and sauté. Let the vegetables melt a little until they soften yet retain a certain firmness (about 5 minutes). You don't want the vegetables used in a quiche filling to be too soft, especially since they will cook again when the quiche is in then oven. If you are adding protein, cut the protein into small pieces, unless you have thin slices that can be laid on the bottom or top of quiche before baking. Put the oil in a pan over medium heat and then add the cut protein and sauté. Make sure the protein is cooked, yet remember it will cook a little more when the quiche is in then oven. Add the fresh or dried herbs, garlic or other seasonings and cook for another minute or so. Fresh herbs do not need to cook long. Add your salt and pepper. Let cool slightly. In a separate bowl, mix the eggs, milk and grated cheese. This is also the moment to add any neutral cheese added for creaminess, such as Ricotta or cream cheese. Roll out the pasty crust dough and place it over your baking dish, leaving a little room on top for decoration. I usually just crimp the dough between my thumb and forefinger as I go around the dish. If you are feeling more artistic or creative, feel free to add other designs to make your quiche stand out. Add the vegetables to the egg-milk mixture. And then pour into the quiche crust. Another option is to spread the vegetables along the bottom of the crust in the pan and then pour the egg-milk mixture on top. This option is especially good if your filling is composed of items that can be presented along the bottom to make your quiche more presentable (for example, with asparagus stalks). Put the quiche into the pre-heated oven and cook for about 45-50 minutes until the top is lightly browned and the crust starts pulling away from the pan. *Use only the egg yolk to make the dough for the crust, but save the egg white for brushing on the crust before filling it, as indicated in the pastry crust recipe. Brushing a little egg white on the bottom of the crust helps prevent the crust becoming too soggy. I love how easy quiches are to make, and how much goodness you can pack in them! Yours looks delicious! Thanks, Raia! I agree. Such a quick supper or lunch option, especially welcome during the week. Quiche is one of my favorite breakfasts! Bake once, eat for days! Thanks, Linda. I can never get my quiche to last for days. Quiche is definitely a versatile dish ready to be served at breakfast, brunch, lunch or supper and anything in between. I love a good homemade quiche! They’re a favorite in my home. So true about the fillings, you can really mix it up with proteins, veggies and herbs. And cheese!!! Gotta love the cheese in them. I do too, Emily! My kids also love quiche. It’s so easy to make 2 different kinds of quiche at same time to suit everyone’s tastes. This looks amazing! Quiche is so versatile! Thanks, Michelle. Come back to share info about the versions you create.